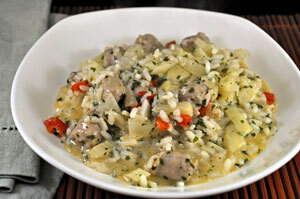 Easy Dinner from Thyme for Cooking: Sausage, Pepper and Fennel Risotto. Risottos should be creamy, smooth, almost soup-like, never stiff. The risottos that we have eaten in northern Italy have all been served in soup plates (flattish bowls) and eaten with a spoon - not a fork. It's not necessary to stir constantly, but do stir often. This is what makes it creamy. Lots of butter and/or actual cream are totally unnecessary. I cook them a bit more slowly - 30 minutes, rather than 16 - that helps the creaminess, also.